This tutorial will show how to tie a braid with a ribbon. A ribbon is a very convenient braid tie in that if it is braided in, it will not slip out even in athletics. The ribbons chosen can be hair color to make the inconspicuous or bright to decorate the braid. Multiple ribbons can be used for creative effect. Rougher fabric ribbon will hold better but is not as gentle on the hair. 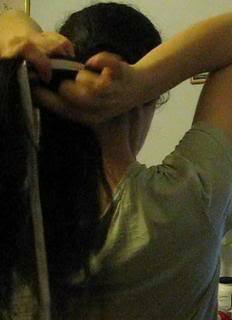 Silk will grip and tie very well and is very gently on the hair. Satin is gently but may slip a bit and start untying. Where you start braiding the ribbon in depends on ribbon length. The ribbon folded in half has to be a bit longer than the hair if held at starting point. 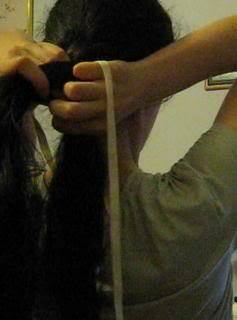 Then take a ribbon, holding it in the center of the length. Align center of ribbon to the braid when you grab the next strand for braiding, grab one of the ribbon ends with it. Repeat with the next strand. Braid as normal from then on until where you want to tie off. 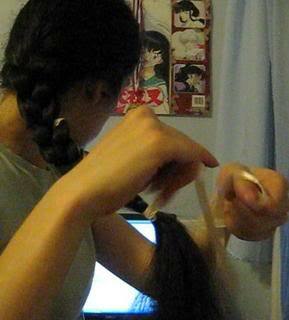 Keep all the hair together, grab one ribbon end and wrap it around the braid end a couple of times. 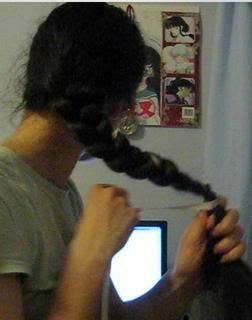 Do the same with the other braid end in the opposite direction. Tie the ends together right at the center of this wrapped part. Then either do a bow or another knot as desired. Here I just tied one knot. For more security in whole day wear, tie another knot or bow after this. Leaving the ends loose as I did here can make the tassle look thicker, especially when the ribbon matches your hair color. For an example of how to do this there is a video of how to do this. I still have to try this! Nice style, thanks for the explanation. Bookmarked it too. Yes, but you can access this by going to articles section and reading the article from there. nice guide. it seems a little difficult. I want to do the heatless curls tonight.